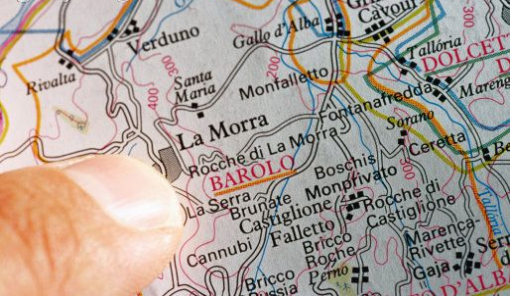 It seems not a week goes by where I don’t mention Barolo somewhere on the blog, but from the emails I receive, especially from the US, it seems Barolo is less well known than Brunello di Montalcino by some segments of the wine drinking community. Whilst it is true that Brunello di Montalcino has come on in leaps and bounds and is picking up award after award with the wine press, Barolo is certainly my favourite Italian wine. Barolo is consistently produced at a high level, there are 20 or 30 excellent producers who rarely fail to make a stonking wine year after year. Barolo is a less “in your face wine” than Brunello with more femininity and complexity. If you compare an average Barolo to an average Brunello, its my opinion that the Barolo is the better wine. Barolo comes from the Piemonte region of Italy in its north western corner bordering France. Perhaps because of this proximity the Piemonte can be considered the most French like Italian wine region. The wines from the Piemonte boast a sense of class and tradition with many of the old viticulture techniques still rigidly adhered too. This is especially true for Barolo, which is going through its most interesting developmental stage in its long history. There are currently two schools of Barolo production fighting it out to produce the best possible wine from the the regal Nebbiolo grape. Old school Vs New school wine making tends to only benefit the wine drinker as both schools push the other to produce wines of higher and higher quality and that is exactly what has happened. For those who see the world of wine as a chance for investment rather than pleasure, Italian Barolo is hot. The world’s best Barolos come out about 5 times cheaper than the world’s best Bordeauxs and and as a wine that improves substantially over time, investment in Barolo must surely be a good move. This will be my policy when buying wines over the next 10 years. So what is new school Barolo? New school Barolo favours short, hot macerations and spells in new oak. Each producer is experimenting year on year with different kinds of oaks, size of barrels and the time spent in them. Traditionally Barolo was macerated for weeks (making the wines less accessible for early drinking) and allowed to spend years in Slavonian barrels. These experimentations in the wine making process has produced many different and exciting kinds of Barolo. So who produces the best Barolo? The questions is difficult to answer as the two schools are producing different types of Barolo so we need to split it up New School Vs Old School. The most famous traditional producers would be: Giuseppe Rinaldi, Giuseppe Mascarello, Giovanni Conterno, Paolo Conterno, Cavallotto, Bruno Giacosa, Luigi Pira, Vietti. Modernist producers among others: Scavino, Ceretto, Sandrone, Domenico Clerico, E. Pira, Parusso, Silvio Grasso. What kind of wine is Barolo? As it used to take a good 10 years to soften up and become accessible the wines went from being a dark ruby to a much lighter brick red and the bouquet became less punchy over time but very opulent and refined. The Giacosa Barolo Falletto 1998 is at a great age to show these characteristics, I highly recommend you try this 97 Point beautiful wine. The modernist Barolos still age but can be opened 5 years off the vine. These Barolos are darker and much more fruity and more appealing to an international market, I mean the USA, I mean wine critics, I mean Robert Parker! My personal preference is for the aged traditional Barolos but only just, I think the wines of Domenico Clerico alone marks a great case for modern Barolo. The traditional Barolos can be very awkward between 5-10 years old, so if you want to try a young traditionalist Barolo make sure its very young, IE, this years bottling OR buy a 1998 as the youngest choice, preferably older. Over Christmas I sampled two Barolos that do illustrate the differences quite well. Cavallotto’s traditional Barolo and Sandrone’s 2000 modernist effort scored the same points for my palate, whilst being really very different wines, they are both quality. Where can I buy this wine? – The Cavallotto gives better QPR. Have you tried Barolo and if so, who is your favourite producer? My favourite Barolo comes from Giacomo Conterno. I think he is the real kind of Barolo. Sarah,nice post.I love ICARDI’s Parej 2000.Definitely a “new” Barolo.I never drink “classical” ones, since I’d go for an Amarone instead (please remember that I live in Verona…)ciaoalexp.s. – You din’t mention GAJA, who makes an excellent Barolo (a bit too expensive though). anonymous sayd: “You din’t mention GAJA, who makes an excellent Barolo (a bit too expensive though)”. Error: Gaja don’t make Barolo, but only Langhe Nebbiolo, who have the possibility to add other grapes (Barbera, but also Merlot and Cabernet if you want) to Nebbiolo. Nice post. Also worth mentioning in the same context is Barbaresco – virtually all the benefits of Barolo but at more competitive prices. Both zones are quite small and are easy to visit at the same time (about 10 miles apart) with the town of Alba between them.I like Cossetti barolo by the way. nice article….check out http://www.theitaliancellar.blogspot.com for other interesting tasting notes. I have only just started my journey into Piedmont. Ive had a couple of Barolos etc. One I found certainly worth looking into is Antoniolo Gattinara. Different region, different climate, same magic. ps. America doesnt have a clue how lucky it is. To buy any of those wines you can in America (if you can even find them) will cost you 150% extra. Im so excited to be spending Christmas over there as Ill be drinking a years worth! Great guide with some important insights. I'm off to La Morra tomorrow and have visits with several of the producers (mainly traditionalists) you mention. But I was wondering – isn't it about time for an update of the guide?